These Thorofon recordings are recent, and I ordered it, because I am a admirer of Reger's music, but I would welcome opinions, or even the happy owner of these recordings could enlighten me, as too the quality. I will eagerly await this fabulous box. Well done, an ambitious purchase of an ambitious undertaking. This series has cemented Becker's place on the Max Reger Institute's board of trustees. I have cherrypicked two volumes, trying to avoid as much as possible Max's insatiable need to enhance upon other composers. In much of the series' 12 volumes, Becker displays qualities of Reger not heard enough. Humor, charm, feeling. Where have these pieces been? Mostly buried by critics and musicologists, I suppose. I also suppose, if I may leap ahead, that Becker would clearly show advantage over Hamelin, were Marc Andre to record some of these "lesser" works. What is clear, so far to me, is that these two pianists complement each other beautifully. Hamelin for power and rote. Becker for detail and delicacy. We can hope that this project somehow inspires others to record more of Reger solo piano. Hamelin, Schiff, Peter Serkin, Scherbakov, Berezovsky, come immediately to mind. I also suppose, if I may leap ahead, that Becker would clearly show advantage over Hamelin, were Marc Andre to record some of these "lesser" works. What is clear, so far, to me is that these two pianists complement each other beautifully. Hamelin for power and rote. Becker for detail and delicacy. Thank you so much for this reaction. 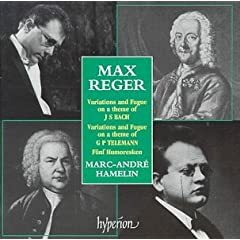 It pleases me greatly to find another lover of Reger's work. Will buy his piano works anyway. Three Regerites appearing within a couple of days is quite impressive. Maybe awesome. Maybe unheard of. The Reger orchestral works have the most interest for me. This would include the Mozart, Romantic, Hiller, Boklin (Salonen, Zagrosek, Jarvi), and the violin concerto (Scherzer/Blomstedt). The piano concerto has not had much impact for me. Serkin is the best I have heard. Douglas I would like to hear. Of solo piano, as already mentioned, Hamelin and Becker. Of chamber, string quartets Op. 109 & 121 (Mannheimer), clarinet quintet, string sextet (Meyer/Vienna String Sextet). I noticed in that old thread there were several recommendations for Naxos. I have tried most of them and I did not think they competed very well. With the exception of the one with the clarinet quintet, I think they would turn more people off than onto Reger. The viola sonatas on Bridge, piano chamber on MDG, and violin and cello sonatas on other labels, can't remember, not Naxos, did not appeal to me. Although I enjoy what I now have of Reger, it could be a closed book for additions. We shall see, or hear rather. Did you know by the way, that the box around the cd's is really made of wood. Thanks for this link Dave! No problem, Harry - I must correct myself slightly concerning 'solo piano' works by Reger - I do own the single Hamelin disc, which is generally well reviewed - the package 'in wood' seems to be 12 discs - quite an undertaking! Boris - thanks for the excellent comments! LOL Dave, you must know I own it, infact I have all the MDG recordings with the works from Reger, and I mean all of them. I heard it once, and I was sold completely my friend. 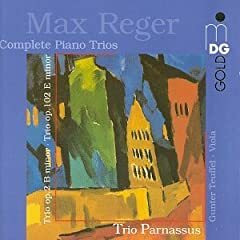 For what it is worth regarding MDG and other labels Reger chamber, I have had the opposite reaction to his use of piano in quartets (incl. MDG), trios (incl. MDG), and sonatas, much preferring the string works. Maybe Reger's association with Szell had something to do with that.